Figures from the World Health Organization and the Government of Ghana, suggest that between 1.8 million and 2.2 million deaths occur every year due to food poisoning and waterborne illness. These figures are approximately equal to the entire metro populations of each of the cities: San Antonio TX, Vancouver BC and the cities of Birmingham and Manchester in the UK. Put another way, in the course of four short years, it is equivalent to the entire populations of these cities being wiped out. Approximately one-in-every-three to one-in-every-four people in the United States and Canada suffer from a foodborne illness every year...and this doesn’t include the number of unreported cases where people don’t visit a doctor or a hospital. Food poisoning and waterborne illness are a major world health concern, yet we don’t have memorial services to those who have perished; instead we have governments that are loath to effectively regulate the food industry because the industry is rich and powerful and can "control" the legislative process. In this book you will learn about some of the bacteria, spores, parasites, viruses and infectious agents that are responsible for food poisoning and waterborne illness. You will also find out about fungal infections, toxic agents and additives that can lead to illness or death. You will then be given a tour of some of the places where food poisoning can occur, such as your own home, the restaurants you visit or hospitals, old age homes, day care facilities and prisons. You will also discover that the food supply chain is a major culprit and prefers to be "self-regulated" rather than submitting to rigorous government inspection. Bioterrorism strikes fear into all of us but it is a reality we have to face in the post 9/11 environment. What, if anything, is being done to guard against it? Finally, you will learn about many possible ways to significantly reduce death due to food poisoning and waterborne illness. You will also find out that governments are reluctant to regulate or take proactive steps to meet the challenge. This book leaves you with the question: why? They have to take back their responsibility to guard the health of their citizens by mandating industry to adopt rigorous end-of-production-line testing, in addition to forcing the adoption of new technologies which can save the lives of everyday people. 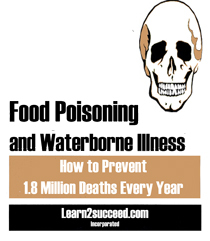 Food Poisoning and Waterborne Illness: How to prevent 1.5 Million Deaths Every Year by: Learn2succeed.com Incorporated: Softcover; 116 pages; ISBN: 978-1-55270-449-3 published in 2012; $19.99.